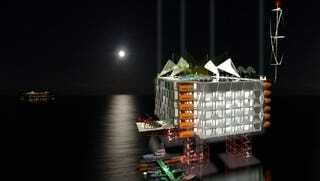 What do you do with 4,000 decommissioned oil rigs in the Gulf of Mexico? Instead of blowing them up—costing millions and killing aquatic life—Morris Architects' Hotelier At Sea project turns them into Dubai-esque luxury hotels. According to BldgBlog, approximately 4,000 oil rigs in the Gulf of Mexico will be decommissioned within the next century. Morris proposed to convert this space into exclusive, self-sufficient eco-friendly, high-end resort islands off the Gulf of Mexico, dubbing it our very own American Dubai, as you can tell from the yacht parking lot seen in the gallery below.